A computed tomography imaging exam, or CT scan, is a test that uses special X-ray equipment and computers to make detailed, cross-sectional pictures of organs and bones. It is a painless way for doctors to see inside the body. CHOC radiologists use specialized, pediatric expertise and state-of-the-art equipment to interpret the CT scan pictures to help diagnose problems or check the body’s response to treatment. When is a CT scan needed? 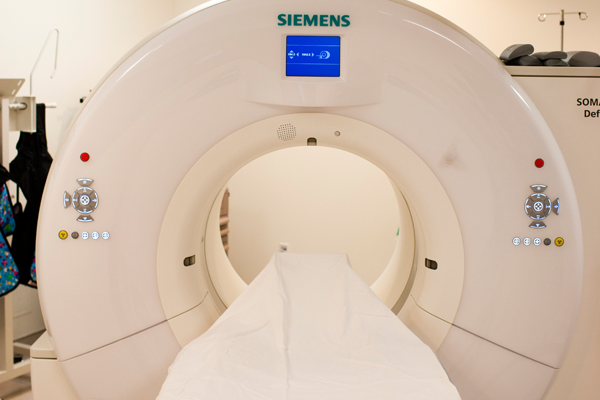 CT is used to help diagnose a wide range of conditions due to injury or illness. In children, CT is typically used to diagnose causes of abdominal pain, evaluate for injury after trauma, diagnose and stage cancer, monitor response to treatment for cancer, and diagnose and monitor infectious or inflammatory disorders. CT may also be performed to evaluate blood vessels throughout the body. With CT, it is possible to obtain very detailed pictures of the heart and blood vessels in children, even newborn infants. What type of CT scan machine is used at CHOC Children’s? CHOC Children’s is proud to offer our patients the very latest in CT technology. Our scanners deliver extremely low doses radiation and are so fast that repeat scans are rarely needed. In fact, other hospitals have begun transporting newborns to CHOC for imaging because of these capabilities. This state-of-the-art machine is only found in a handful of children’s hospitals throughout the United States. Scans the entire body in less than 5 seconds. Uses a very low dose of radiation while producing high-quality images. Allows the technologist to customize the scan based on the child’s measurements and symptoms and protect dose-sensitive organs. Can a CT scan harm my child? A CT scan is a safe, noninvasive procedure used to diagnose problems inside a patient’s body when pediatric safety protocols are followed. CT scans result in a low-level radiation exposure and the benefits greatly outweigh the risk of harm when diagnosing disease and traumatic injuries. At CHOC, We are accredited by the American College of Radiology for MRI, CT and ultrasound, which ensures the highest standard of image quality, ongoing oversight by a medical physicist and proper monitoring of radiation exposure. When you see the ACR seal you can rest assured that your treatment will be done at a facility that meets the highest level of quality and radiation safety. Because children are more sensitive to radiation, they should have a CT study only if it is essential for making a diagnosis and should not have repeated CT studies unless your child’s physician deems it necessary. Children should wear loose, comfortable clothing and may bring a “comfort item” to hold during the scan. Depending on the type of study needed, the child may need to drink a liquid and/or have a liquid dye material called contrast injected to complete the exam. The IV contrast is needed to check the blood supply of the area being studied. The IV contrast is considered very safe. Lab tests may need to be done prior to the day of the scan. The child may not be allowed to eat or drink prior to the procedure depending on the specific scan ordered by the physician. A CHOC Children’s radiology team member will call you one to two days prior to your appointment to explain the procedure and to discuss preparation instructions. While a CT scan is non-invasive and painless, we understand that these machines can be frightening to your child. Our associates—from our pediatric radiologists to our specially trained imaging technologists and nurses—work alongside our dedicated child life specialists to educate patients on their imaging tests and provide a variety of distraction techniques during their scans. We even have a toy-sized CT machine that can help teach them about the test beforehand. Learn more about our child life specialists and distraction techniques. The CT scan is painless, fast and easy and begins with the child lying down on a narrow table that slides in and out of a doughnut-shaped hole in the center of the CT scanner. Straps and pillows may be used to help the child maintain the position needed for the exam. The scan usually takes about 5 to 10 minutes, depending on the part of the body that is being scanned. It is very important that the child stays very still during the scan, as movement will affect the quality of the images. Many scanners are fast enough that children can be scanned successfully. In special cases, anesthesia may be needed for children who cannot hold still. Some children may require an intravenous contrast material for the scan and is ordered by your child’s doctor. If contrast is ordered, our radiology department will call you to give you detailed instructions on how to prepare for your child’s test. In most cases, the child should be able to resume normal activities immediately after the procedure, unless the child’s doctor has instructed otherwise. If anesthesia was administered, the child will be taken to the recovery area to be watched until the medication wears off and he or she wakes up. If contrast was given, the child should drink plenty of water and fluids to help flush the contrast dye out of the body. A report of the child’s scan will be sent to the doctor who ordered it. Please contact the doctor who ordered the scan for the results. Our CT scanners deliver extremely low doses radiation and are so fast that repeat scans are rarely needed. In fact, other hospitals have begun transporting newborns to CHOC for imaging because of these capabilities. This state-of-the-art machine is only found in a handful of children’s hospitals throughout the United States.